Life’s busy. There is always time for cooking, though – and it’s a special day when we can share a good, simple recipe (or two) with friends. Since kiddo number three (almost three months old) was born, I’ve gone back to my staples for meals: a big salad with a nice protein and fresh bread; a big bowl of roasted vegetables with some fantastic cheeses on the side; there is always some wine and dark chocolate to make the day special (obviously). Simple, high-quality foods and a bit of grape juice is my Mama Mantra. My husband and two toddlers aren’t always in the mood for a huge salad or a hunk of Manchego, so I prepare a big pot of this or that every few days. Maybe a hearty chili or stew, or in this case, a delicious, vegetable-rich soup. 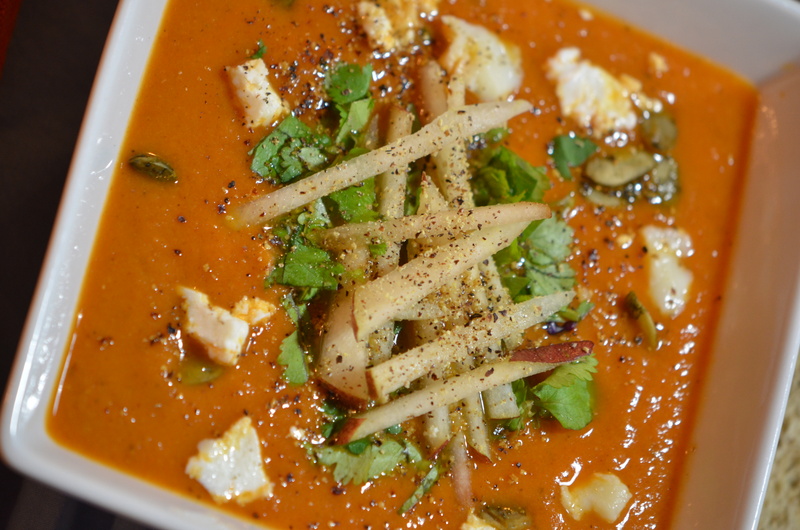 The deep orange, clean-tasting roasted red pepper, pear and squash soup is velvety and smooth. There are plenty of pears and winter squash available at the farmers’ markets and our local Co-Op, so it’s a seasonal and inexpensive dish to make. Feel free to play around with the flavor profile and even the fruit and winter squash varieties to highlight what’s seasonal in your region. Of course, gluten-free, dairy-free (yet oh-so decadent) dark chocolate tahini truffles are a dessert every member of our family (well, maybe not the newborn) has gone crazy for! So small, yet so addicting. We whip up a batch of these babies pretty much every week. Each preparation is an opportunity to experiment with new flavor combinations and varying textures. Be your own chocolatier with this recipe and create your own perfect taste. Play with the toppings and the add-ins to the truffles batter. Of course, a glass of red wine is a non-negotiable, essential pairing to the creamy, sweet and slightly salty treat. It’s five-o’clock somewhere! What are your go-to meal after a long day? Do you have a favorite evening sweet treat? Are there any new family favorites? I’d love to hear what’s making repeated appearances at your scrumptious table. Melt the butter and olive oil over medium heat in a large stock pot. Sauté the carrots, onion and celery until tender, about eight minutes. Add the chopped garlic and sauté a couple of minutes more, just until fragrant. Season with salt and pepper. Add the roasted red peppers, pears, winter squash, spaghetti squash, chicken stock and lentils. Season with the herbes de Provence, to taste, a teaspoon at a time. Allow to simmer over low heat for as long as time allows, at least 25 minutes or several hours. Stir occasionally and reduce heat if the soup begins to go beyond a gentle simmer. Remove the soup from heat and puree using an immersion blender. Or, use a standard blender and puree in batches, using caution, as the soup is hot. Place the yogurt in a bowl. Slowly whisk in two cups of the soup to temper the yogurt and prevent the soup from breaking. Add the yogurt mixture back to the pot, whisking well. If the soup seems too thick, whisk in additional chicken stock. Taste the soup and adjust seasonings (salt, pepper, herbes de Provence) as needed. Serve with garnishes, if desired. Optional toppings of choice, such as toasted sesame seeds, cocoa nibs, sunflower seeds, etc. 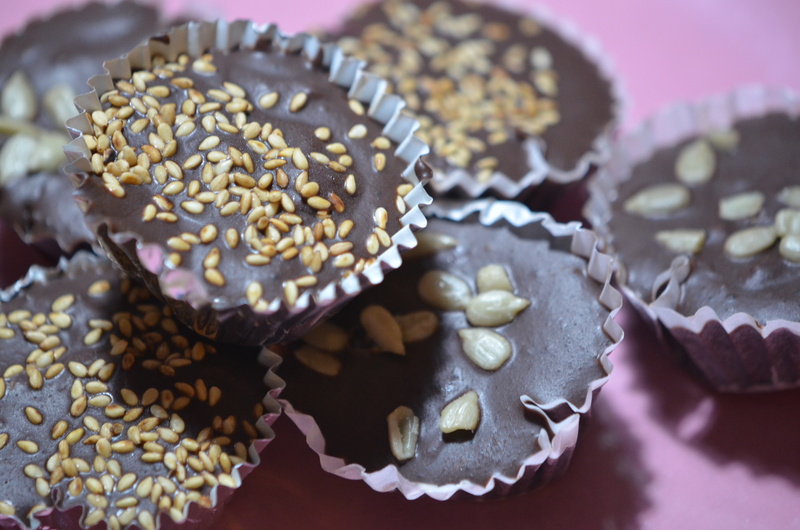 Place small paper baking cups into miniature cupcake tins. Beat tahini with an electric mixer on medium speed, along with the goat butter, until completely smooth. Melt the chocolate over a double boiler, stirring with a spatula, until smooth. Add a pinch of salt, espresso and vanilla. You may also gently melt the chocolate in a microwave in 30 second intervals. Remove chocolate from heat. Fold the tahini mixture into the chocolate 1/3 at a time until completely combined. Fold in optional add-ins, if using, to taste. Then, using one tablespoon at a time, add enough honey or maple syrup to make the mixture adequately sweet. This will depend on the sweetness of the chocolate. Pour into baking cups. Top with sea salt and optional toppings, to taste. Refrigerate until firm, at least an hour. Store in an airtight container at room temperature or in the refrigerator for a longer shelf life. 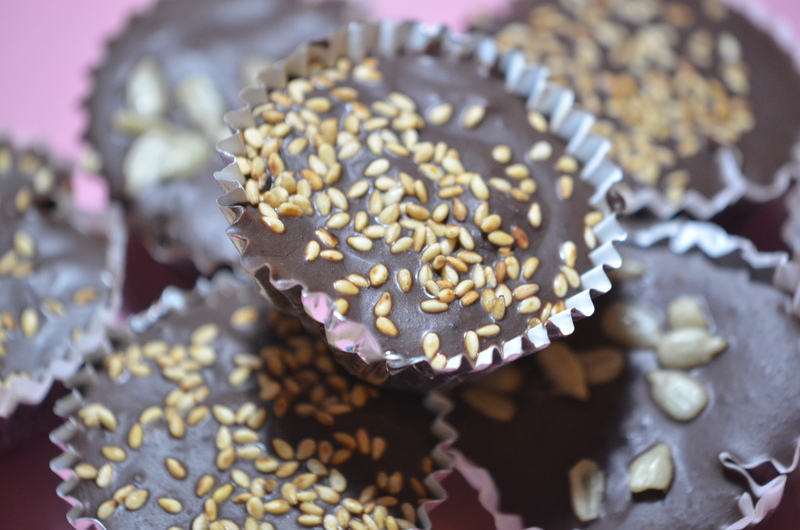 Posted in Chocolate, Dairy-Free, Gluten-Free, lactose-free, Soups + StewsTagged Dairy-Free, dark chocolate, gluten-free, Sea salt, sesame seeds, tahini, trufflesBookmark the permalink. So glad to see you back! This soup and the truffles look delicious. The winter months bring more stews and soups to our house as well. So simple to make and yet packed full of flavor. As a mama to three you certainly deserve your red wine and chocolate, I know I look forward to mine as well! Who would have thought tahini and chocolate? They look delicious. I am sure you are glad to be able to enjoy a glass of wine again. Absolutely. 🙂 Thank you for your note and kind words! Shanna the soup looks gorgeous! Tahini truffles? Yes! I love the sprinkling of sesame seeds on the truffles. Beautiful photos….making me hungry…. Thank you, Kiyo. 🙂 We are both big sesame fans (and chocolate ones! ), aren’t we. Can you easily find Tahini in your neck of the woods? So you’re at work! Compliments and thanks for sharing this two delicious recipes. Thank you much, sweet Silva! Beautiful treats, both. So glad to hear from you. Blessings to your family! I appreciate it, Kathryn. 🙂 Thank you so much! Yes, Shanna, very delectable savory pear soup and delightful tahini chocolate cups. In our home, go to treat is always fresh fruits. There are at least 5 kinds of fruits in the fridge. Lentils, lentils and more lentils are my treat. Because they are so warm and filling, and take flavours such as chilli, spice, salt so easily. In fact, seeing the soup above reminded of them. It’s interesting what you say about protein with the salad – I love protein. Hope you are enjoying life with the 3mo! I completely agree about needing a little protein with my greens… and you’re giving me some great ideas for lentils, Denise. You can’t go wrong with chili and salt! Damn deliicous, even i love it even more if you using charred grilled instead of roasted red peper for the soup, lovin it’s intens smokey flavour..
never had pear in soup or tahini on dessert before, what a great idea!!! My two favorite twins ever. 🙂 I hope you guys try them! MMMMM, chocolate. 2 amazing tasty wonderful recipes too! I ma making them today, both of them! Yummm! You are so kind and warm, Sophie. I think you’ll love the truffles, right up your alley! 🙂 Take care! Tahini and chocolate? Can’t believe I’d never thought of that before, because it’s clearly perfect! Will the proprietors of the fabulous Gourmandistan be doing any tahini and chocolate experimentation in the kitchen? 🙂 Have a good week, Michelle! Looking good, Shanna! That soup is so pretty–especially love how artfully you garnished. And I am so excited to see that truffle recipe. Actually have tahini in my fridge and wouldn’t this be a lovely way to use it? 🙂 And of course on the red wine. Only have 30 more days to finish that boxed Trader Joe zin! Both your recipes sound wonderful! Nothing light a lean meal, leaving some room in your stomach for a bit of chocolate afterwards ;-)! Thank you, Sabine. 🙂 I agree! Shanna! This soup is so beautiful. I really like the way you garnished it. That truffle recipe with tahini. Beautiful. I love everything about this. I’m so making both of these. Wow. Thanks, Amanda. Let me know what you think. You have a great palate and will perfect the recipes.